Heather has reached the pinnacle of the publishing world through weaving suspenseful plots in romantic novels featuring vampires. She's the toast of the town to most, but to David, her fiction threatens to toast a whole generation of readers in the broiler of Hell. He writes his own book to enlighten the world about the dangers and evil of vampire glorification. He and Heather appear to be perfect candidates for a fierce war of words, but the ardor for battle is diminished by their mutual attractive. Despite their attempts to squelch the magnetic pull, their chemistry causes romance to bubble under the surface through all of the twists and turns of their adversarial relationship. While Heather's mother schemes to get the two together, an old gentleman at the nursing home attempts to set David up with Cindy, a nurse at the home. Cindy's beauty falls short of Heather's, but her spiritual beauty surpasses and grows as she places her love for David on the alter and focuses on worshipping God rather than one of His creatures. As David's life of service to God poses continual challenges, he struggles to deal with the romantic tug of war which threatens to paralyze him and unravel the tapestry of his ministry. As a man who communes with God on a daily basis, he receives the word from the Lord that he needs to trust that be well. He does trust when faced with a dangerous situation on the streets, but allowing God to safeguard his heart proves to be a tougher assignment. When Heather Culebra becomes the toast of the literary world with her bestselling vampire romance tales, it spurs David Justice - a devout Christian - into action. Determined not to let Heather's seductive, vampire-worshipping fiction condemn an unsuspecting world to hell, David pens his own book, designed to enlighten humanity to the dangers and foreboding evil of praising her works. Strangely enough, the passion of their respective endeavors soon pours over into a downright magnetic attraction between the two diametrically-opposed authors - despite their efforts to fight it. The only problem? David's growing love and affection for Cindy, a God-fearing nurse who offers the grounded spiritual substance he lacks in his fleshly pursuit of Heather...in the resultant romantic tug-of-war, which spiritual force will ultimately be the winner of David's mind and heart? 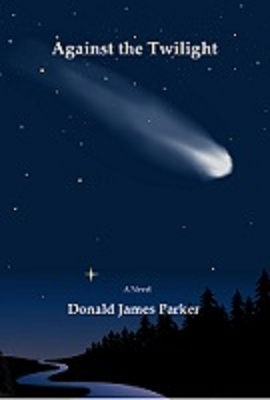 In Against The Twilight, prolific author Donald James Parker has crafted a clever, multi-layered romance tale that readers from all backgrounds can appreciate. On one level, the unfolding drama, intrigue, and suspense of David's love-triangle entertain is sure to entertain, while on another level Parker addresses the much-hyped hold that vampire mania has recently established over modern pop culture. In what has become his signature fashion, Parker dissects the relative strengths and weaknesses of the phenomenon, incisively dicing them into a fine dust with the sharp blades of logic and reason. Supported by biblical scripture and conventional wisdom, Against The Twilight puts up a convincing fight in highlighting the flaws of idolizing anything rooted in - and masked by - deception and ambiguity. The latest enlightening offering from a standout literary talent, Against The Twilight is sure to warm the heart - as well as unnerve the weak-minded and easily swayed.